Trade your razor for a laser and get smooth, soft skin as your permanently reduce unwanted hair with Laser Hair Reduction. Are you tired of spending extra time shaving everyday? Does irritation from ingrown hairs and razor burn make you dread shaving? Is regular waxing proving to be costly and short lived? Then, it’s time to start permanently reducing your unwanted hair and enjoying unbelievably smooth and soft skin everywhere you dare to go bare! 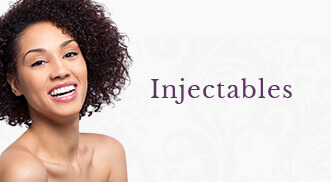 Laser Hair Reduction is one of the most commonly performed cosmetic procedures in the United States. It involves the process of reducing unwanted hair by means of exposure to pulses of laser light. Lasers work by utilizing a wavelength of light that targets the dark pigment in our hair follicles. In turn, your hair absorbs the energy and follicles are disabled from growing fully again. With each subsequent treatment, the ability of those follicles to regenerate new hair is disabled more and more. Because our hair has several growth cycles and each is different, dependent on location on the body, multiple treatments are needed to catch each active growth cycle. This leads to up to 80% reduced hair growth, and sometimes, a reduction in the the thickness and the texture of any returning hair. Because the lasers used in Laser Hair Reduction are attracted to dark pigment within a hair follicle, the best candidates for this treatment have dark hair. Unfortunately, blonde, grey and translucent hair does not respond well, as it does not absorb the laser’s energy effectively. As the laser is attracted to pigment, it is also advised that you do not have an active tan before or after your treatment to avoid complications. Many of our patients opt to start their Laser Hair Reduction packages in the Fall and Winter as a result. Your Certified Laser Technician will ensure that you are a good candidate for Laser Hair Reduction at your initial consultation and help you devise of strategy on when to start your treatments. Once it has been decided that you are good Laser Hair Reduction candidate, you will be asked to shave the treatment area the day of or day before your appointment. This ensure that the laser energy is absorbed deep within the follicle and not at the surface of the skin. Common areas include the lip, chin, neck, underarms, bikini area and legs. Our patients describe the sensation of the laser like a light rubber band snap gliding across the treatment area. Certain parts of the body may be more sensitive than others and your technician will temper the pace of your treatment to accommodate this. Immediately after your Laser Hair Reduction treatment, you may be red and slightly swollen for up to 48 hours. A topical hydrocortisone cream or Ibuprofen is advised if needed. As the next two weeks progress and your next growth cycle of hair begins to surface, you’ll notice shedding of the treated hairs.For your safety, it is imperative that you use an SPF 30 or more throughout the course of your treatments. This will protect your skin post laser and prevent any tanning to your skin. Please, do not be surprised if you are asked to reschedule a treatment if you have an active tan. Our Certified Laser Technicians are first, and foremost, concerned with giving you the safest treatment possible. Each time you return for treatment you will notice less and less regrowth. On average, each laser treatment reduces your active growth by 10-25%. Your technician may increase the intervals of time between your treatments as well, but it is normal to return every 4 to 6 weeks depending on area of the body treated. Once your package has been completed, we recommend annual maintenance treatments to keep you hair free for good! Are you interested in learning more about Laser Hair Removal?